NOEL GALLAGHER has issued an ultimatum to brother LIAM — sort your voice out or forget recording another OASIS album. Noel was furious with Liam’s below-par performance at the Brit Awards on Wednesday night. He reckons the rocker’s vocals on hits including Cigarettes & Alcohol failed to match his status as a member of the band that won the Outstanding Contribution gong. And he told Liam that he needs to rediscover the brilliant, roaring notes that made him the best frontman of his generation . . . otherwise Oasis are no more.A source said: “Noel had some harsh words for Liam after the show. I thought Oasis were brilliant at the Brits, blasting out an explosion of sound at Earl’s Court. But the crowd’s singing drowned out Liam’s vocals.Having watched it back on TV, he seemed short of breath and strained his voice to the point where he sounded like a caricature of himself. His swagger was still superb and attitude seeped from every pore.But only Noel got his vocals spot-on during the short set. 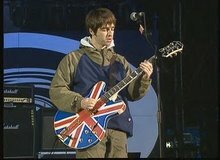 He absolutely nailed Don’t Look Back In Anger. The buzz the lads created at the awards proved they are as popular as ever. liam como musico profesional deberia preocuparse un poco mas en cuidar su voz, pero escucharlo gritar los coros de cigarettes para mi es la gloooooria. oe esto no sale en oasisinet.